Halloween costumes based on internet memes are a great idea because you get to (a) spend the entire evening explaining your costume to normal people who don’t spend all of their waking hours online, and (b) you can tweet a picture of said costume and the nonfunctional people who do spend all of their waking hours online will applaud it. 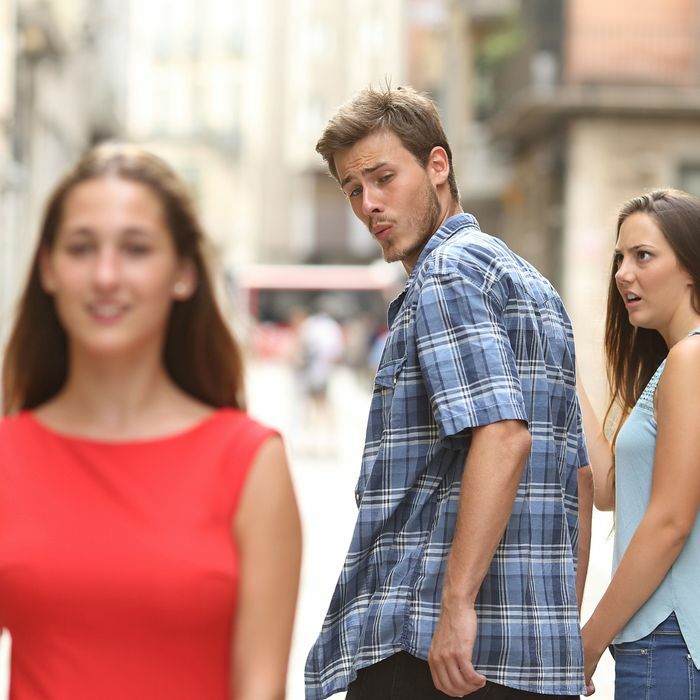 Here’s a look at a perfect execution of the distracted-boyfriend meme. We included the distracted boyfriend as a group-costume idea on Select All’s list of easy 2017 meme costumes, but we’re adults here and we’re not afraid to admit that we were wrong. This costume clearly works better as a solo act. Though, if you must, you can still grab two friends and do this as a trio. Just know you’re committing to standing side by side all night long.